Media streaming boxes such as the AppleTV, XBox 360, PS3, and products from Netgear, do a varying job of bridging the gap between the PC and television, as well as in some cases, delivering Internet content directly into the living room. But all are closed systems. The result of which is that users are left trying to hack these devices against the wishes of manufacturers (see our post ‘When will Steve Jobs open up the AppleTV?‘) or have to make-do with whatever official features are implemented. Bucking this trend, Neuros is taking a wholly different approach, and has open-sourced the firmware for it’s Neuros OSD media-center, meaning that anybody is free to write add-ons that extend the device’s functionality. 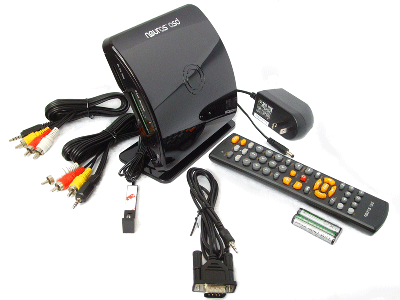 The Neuros OSD is a versatile box that can act as a Digital Video Recorder capable of recording from virtually any source (cable or satellite TV, DVD, DVR/TiVoTM, VCR, game console, camcorder, etc), as well as stream and share video, music and photos between various devices including home entertainment centers, PCs and portables such as laptops, iPods, smartphones, and the PSP. As already stated, the key differentiator of Neuros’ strategy is that the company actively supports developers who want to ‘hack’ the device to create new features. Last April, in an effort to cash in on publicity surrounding the AppleTV, Neuros wrote an open letter to those that had already begun hacking Apple’s set-top-box. Unlike other manufacturers who typically ignore or may even try to suppress or undermine your contributions, we at Neuros rely on them. Your contributions can get quickly incorporated in our official releases, and you will have a say in the creation of future generations of our devices and the ability to work side by side with our internal engineering team. The big news this week from Neuros HQ was that — thanks to the open-source community’s efforts — users are now able to search and browse the entire YouTube catalog directly from the device. The first version of YouTube support is, understandably, a bit rough around the edges, and has been released early in an effort to get feedback from users. Improvements in the pipeline include a better interface, and added functionality such as sharing and subscriptions. Neuros says that this is the first of many new features we can expect to be added to the device, thanks to the way in which the company is working in conjunction with the open-source community. Why arent more people connecting their PCs to inexpensive big LCDs? I think that’s the future! i use my wii for the internets and tv, thanks. Next time when you nerrate a video put your mouth right around the mic – we’ll all enjoy it more. Let me know when you record another audio track. One in which you don’t actually fellate the mic, and I might be able to stand it long enough to watch the video. maybe it’s not as shiny as an iFawn, but the cool thing about open source systems is that they keep getting better. they don’t create artificial barriers. i haven’t used a Neuros yet but this looks very, very cool. I’d never buy an Apple or Microsoft device except with the intention to install open software. So yeah, i’m biased. my allegiance is to a concept, not to a company or an aesthetic. open source is a better process for making and using software. or make a simple pluggable usb tuner that works with the OSD, or linux in general. Too bad almost all software houses disagree with you. Don’t tell that to BMW, Honda, or Suzuki as they would be happy to sell you a motorcycle, a car, or both. While I wish them luck, the Roku PhotoBridge tried this already. While it has numerous third-party developers, the product is no longer manufactured. It does have full HD support, and works quite well. It would be great to get ToxTox on this device. Toxtox (toxtox.tv is a free and open source media browser based on mozilla, vlc and soon xmpp, rss-tv and bittorrent as well. With ToxTox you can watch all your favorite content using a standard interface and can easily write extensions to implement even more functionality. This could potentially be a great platform for TV 2.0 developments. Did the Roku PhotoBridge play codecs other than MPEG2? mieses: open source is a better process for making and using software. Marth: Too bad almost all software houses disagree with you. Peter: Don’t tell that to BMW, Honda, or Suzuki as they would be happy to sell you a motorcycle, a car, or both. Among other references to analogies that render them meaningless; one might consider the non-point of Ferrari branding on Acer laptops or Jeep branded bikes and golf clubs. According to an extensive survey of practicing historians, George Bush is not only the worst president we’ve ever had, but they largely agreed he was the worst president imaginable. Despite the strong evidence, the public still can’t agree on a proper incarceration for one of his social engineers, Ann Coulter, for saying that John Edwards should be killed by terrorists. If morality was the determining factor in our society, this might concern more people. Open source does hold the moral high ground in the software world, but is completely distinct from ‘software houses’ that seek a profit with a standard business model. Comparing the two models is not unlike comparing the functional similarities of a Jeep Wrangler and Jeep Golf clubs and contrasting their abilities off-road. I for one applaud Neuros for the move, as they will undoubtedly be more successful with this strategy than they otherwise would have been. If competition is fierce from other similar gadgets, they can always start making motorcycles or whatever the slow fellow was talking about. Steve (Jobs|Ballmer) will become president and I’ll be watching youtube videos of Ron Paul on my Neuros. Open-Source is an ideal I’m not sure is yet ready for prime time (if it ever would). Open source make things free & open for people to develop. Unfortunately it typically implies the lack control and standard, which is needed for the application to be user-friendly enough for the main stream. But it’s great for techies and geeks to roam freely. I like open platforms and enjoy being able to play with them from time to time. But I think too often ppl are too passionate about open-source and try to make it into what it is not really meant to be (or at least not ready to be yet). This OSD it is compatible with a Brazilian system Digital TV? maybe it's not as shiny as an iFawn, but the cool thing about open source systems is that they keep getting better. they don't create artificial barriers. i haven't used a Neuros yet but this looks very, very cool. I'd never buy an Apple or Microsoft device except with the intention to install open software. So yeah, i'm biased. my allegiance is to a concept, not to a company or an aesthetic. open source is a better process for making and using software.